The drill-down on my cookbook round-up continues as I present to you Vietnamese Tofu Salad, this year’s recipient of Recipe Most Likely to Join the DALS Rotation, and one of the many dishes I’ve made from Ilene Rosen’s Saladish that have slayed, as the kids say. (Do the kids even say that anymore?) As I mentioned in my official review, Saladish was a standout for its sheer usability. While other titles made the cut because they encouraged unexpected exploration or offered unique perspectives or lyrical writing, this one made the list because I’M NOT LYING I WANT TO MAKE EVERY SINGLE RECIPE IN THE BOOK. It helps that I have been a City Bakery cult-follower for decades — until 2011, Rosen used to preside over the Union Square-area cafe’s salad bar — and that I’ve been waiting for this book to arrive ever since I first piled pea shoots on top of their famous pretzel chicken. 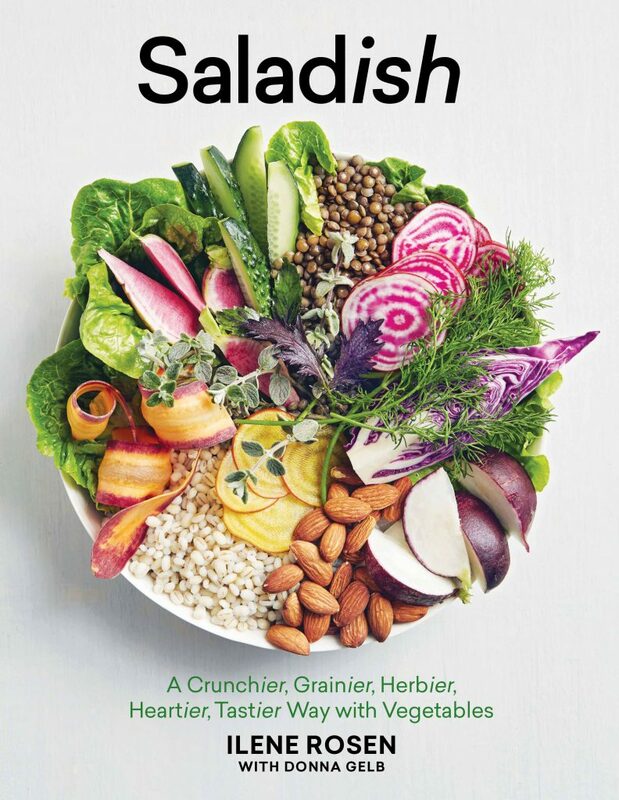 Saladish is also the kind of book that plays perfectly into my most favorite strategy for entertaining: One simple grilled protein, surrounded by multiple in-season vegetable- and grain-based dishes. A few weeks ago, we did this for our friends Anne and Todd. I made Rosen’s Black Rice with Pea Greens and a Red Cabbage and Chickpea Salad with Spicy Tahini. (I can’t even remember what the protein was; that’s how spotlight-grabbing the sides were.) When Todd texted the next morning to thank us, he added that he bought his own copy of the book, which I put down in the Win column. I have not made the below Tofu recipe for friends yet. For the time being it has served only as a weeknight dinner — the kind of healthy, flavorful right-the-ship meal that I crave after a weekend of indulging. Only 3/4 of the diners at my table will eat tofu, but this little hiccup does not stop me because I love it too much to save it for nights when the hater is out of the house. The marinating and the carrot-daikon pickling require forethought, but not a ton of effort, so don’t let that deter you. 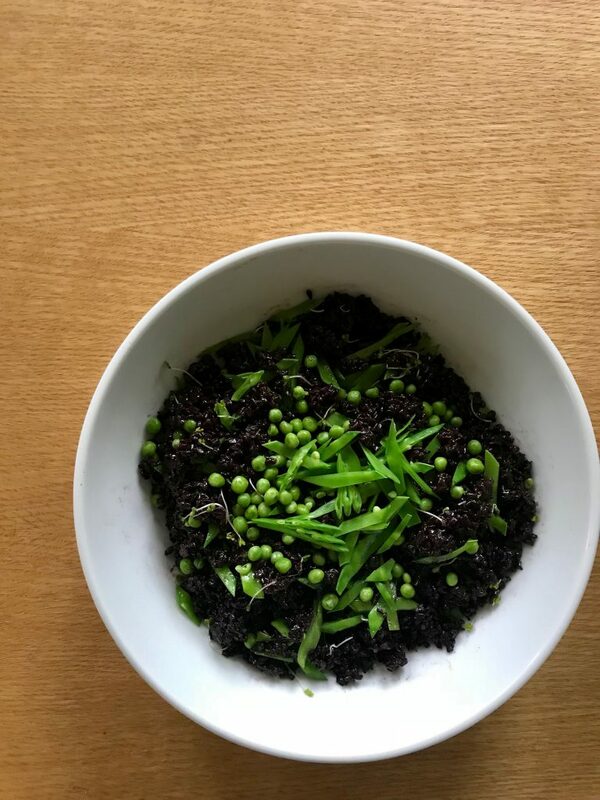 Black Rice with Snap Peas. My rice came out a little gloppy, but I just called it “sticky rice” and no one complained. 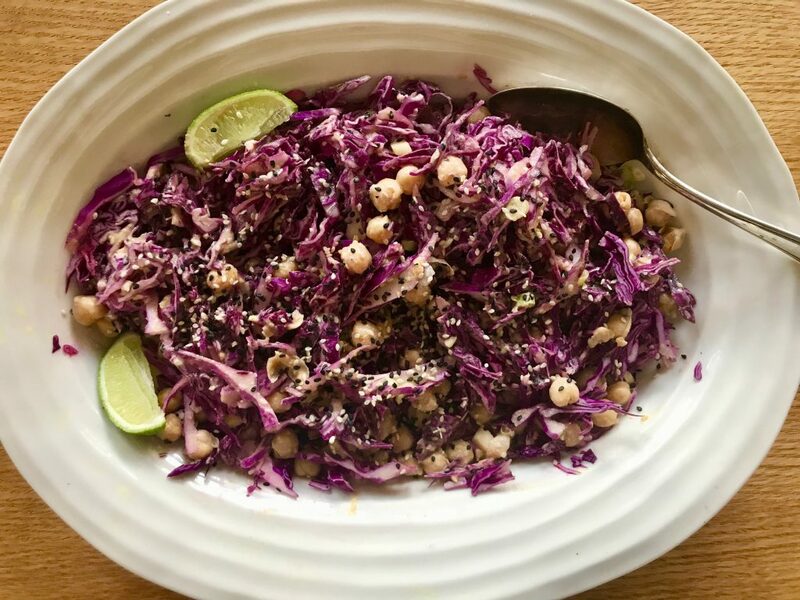 Red Cabbage and Chickpeas with Spicy Tahini Dressing. The tahini dressing calls for harissa and is my new go-to. The book says it serves four, but I find it’s more like three. (Or four as a side.) When I don’t have daikon for the pickling, I replace with cucumbers or butter radishes. Lastly, after removing the tofu from the marinade, I freeze the marinade for later use — since there’s a 100% guarantee it’ll be on a future menu. 1. 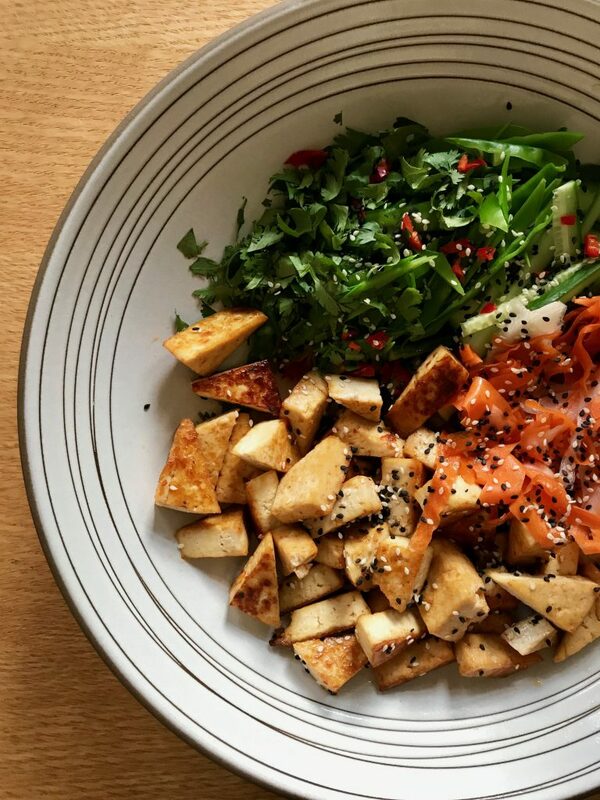 Marinate the tofu: Whisk together mirin, samba oelek, rice vinegar, oil, tamari and honey in a bowl. Transfer to a covered container or a plastic storage bag. Add the tofu and turn it over several times so it is well coated. Cover or seal and refrigerate for at least 1 day, and up to 5 days—the longer the better—turning the tofu (or bag) occasionally. 3. Set the tofu on a sheet pan, reserving any excess marinade. Swipe the tofu around to grease the pan. Cut the tofu block horizontally in half, then cut the still-stacked halves into quarters. Cut the quarters in half to form triangles and spread them out on the pan. 4. Baste the tops with the reserved marinade and bake for 12 to 15 minutes, until slightly crisp around the edges. Let cool, then transfer to a wide serving bowl. 5. Meanwhile, cut the cucumbers crosswise into quarters. Stand each quarter on one end and slice into sticks. 6. Drain the carrot-daikon pickle, reserving the liquid, and add to the tofu. Add the cucumber, Fresno chiles, cilantro, and sesame seeds and toss gently together, taking care not to break up the tofu. Drizzle with a tablespoon or so each of reserved pickling liquid and rice vinegar and sprinkle with salt to taste. Serve. 1. Combine the carrot and daikon in a small heatproof bowl. 2. Combine the rice vinegar, sugar, and salt in a small saucepan and bring to a boil over medium heat. Boil gently, stirring occasionally, for a minute or two, until the sugar is dissolved. Pour the brine over the vegetables and steep until cool. Use right away or store refrigerated in the brine in a tightly covered container for up to 2 weeks. Excerpted from Saladish, by Ilene Rosen (Artisan Books). Copyright © 2018.
mirin is a page-turner for me. what is a good substitute? or where do you buy it? i live in a major city and never see it anywhere, but maybe i’m not looking in the right places? (we had a soy-honey baked tofu last night; my hater grumbled the entire time, but managed to eat it anyway). haha. don’t let it scare you. kikkoman makes mirin, so I’m pretty sure it’s available in the asian section of most supermarkets. the brand I am currently using is sushi chef, which I bought at Whole Foods. I can find mirin in my grocery store and I live in a town of 5,000 in Wisconsin. It’s in the Asian aisle. This looks delicious! I am definitely getting this cookbook. This looks so good. I like to learn new interesting ideas for tofu. Do you think you could saute the tofu in a pan on top of the stove. With a south and west facing kitchen I just can’t bear to turn on the oven most of the summer.